Even though I don't start eating heavy meals but I lack in motivation to get up and exercise. On those lazy days, my lite lunch salads come to my rescue. 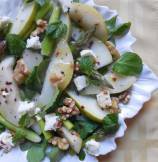 Pear and Asparagus Salad is one of such lite and refreshing green salad. 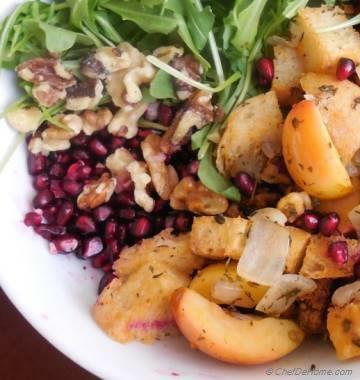 Sweet and tangy, this salad is very satisfying, perfectly satisfy my craving for salt and sweet and keeps me away from evening salty-snack engagements. 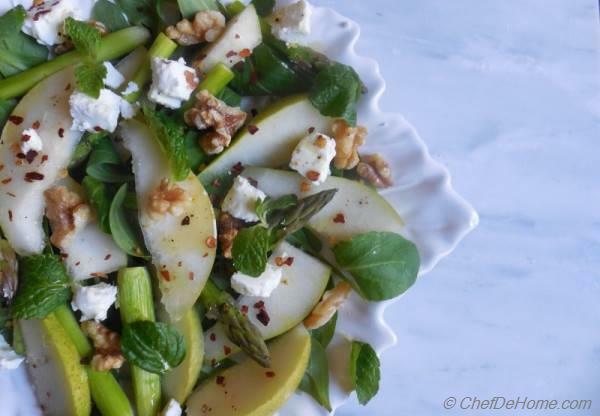 Sharing with you a 10 minute fix to a better and healthy day with my Pear and Asparagus Salad. 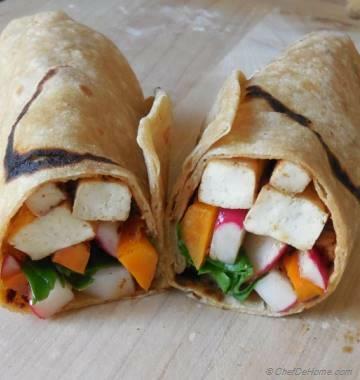 Total Time 10 minutes Prep Time 10 minutes Cook Time 0 minute Difficulty Easy Yields 4 Servings Serves 4 Notes 2 substantial or 4 side servings with protein or bread. 1. 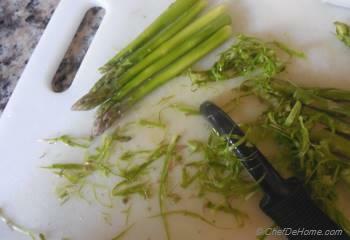 Wash a remove 1 and 1/2 inch ends from asparagus. Use a peeler to peal out the outer dark green skin leaving the floral buds intact. To make the vinaigrette/dressing, whisk together olive oil, lemon juice, salt and pepper and set aside. 2. 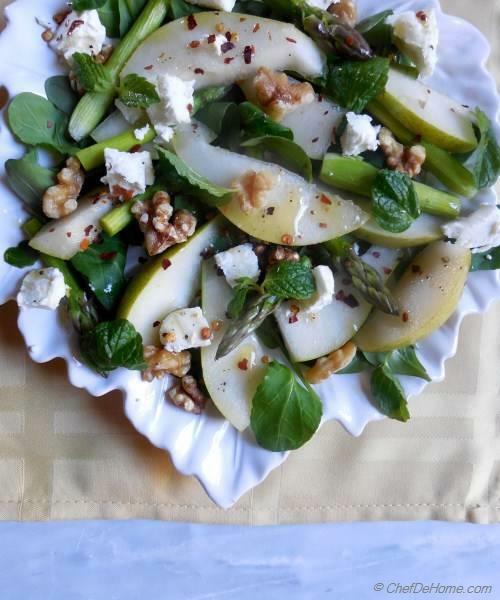 On a serving platter, arrange arugula, top it with sliced pears, asparagus. Top it with walnuts, small dots of goat cheese, chili flakes (optional but enhances the taste of goat cheese) and torn mint leaves. Drizzle lemon-olive vinaigrette on the top just before serving. @Iman, thank you for stopping by! I am glad you like my website. This salad does taste great. Give it a try! @Marc, raw asparagus really taste delicious once you peel-off the outer chewy skins. I am sure you will like it! If not, I recommend steaming it for few seconds after peeling. ummmmm good pictures Savita! I have to say that raw asparagus will be first time for me! thanks for the recipe. Thanks for trying and linking back the recipe @Jennifer. Happy blogging!! I tried out this recipe and blogged about it for a January healthy kickoff series that I'm posting. 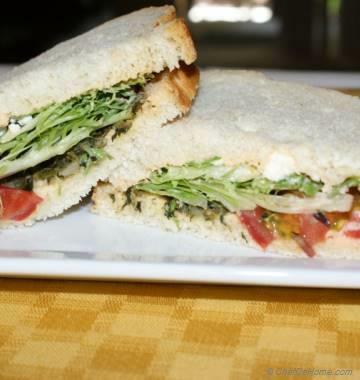 I included the name of your site and links back to you.Thanks for sharing this recipe... it was tasty! Yumm!!! 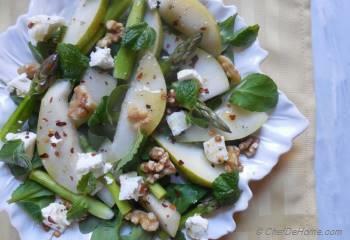 love goat cheese and pears, will try it soon.